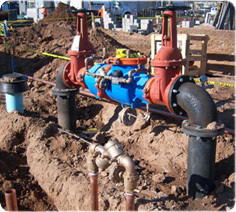 ACI is known for its quality installations of Sanitary Sewer systems. These systems' installations are commonly at greater depths relative to other utilities. Consequently, it is very important to perform the work correctly the first time. This avoids repeating work that may not pass testing process prior to going into operational stages. "Andale Construction Inc. is a company to watch. With sound work ethics and operating principles, this company is going to be very successful"
We work with installations of Storm Drainage systems in public R-O-W and private properties. 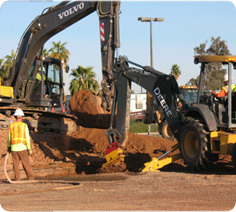 We address the work operations with a safe and professional approach. We consider all surroundings involved with our scope of work. From the project's commencement to its completion we address punch list items and testing to be conducted with proper confirmation. Addressing the installations of domestic potable water facilities are very important to be conducted in a manner that the systems are constructed within conformance of American Water Works Association (AWWA). The connections and thrust points are vital to the security of the Public R-O-W and the environment. Proper handling and chlorination of materials must be respected. 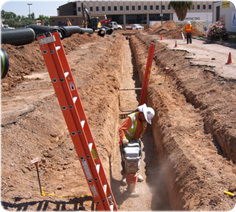 Pressure testing and good compaction are some of the aspects of constructing a quality domestic water distribution facility. Water is a major resource for all life. As such it must be protected and preserved as an asset to good living. ACI builds infrastructure as if it owns it. We warranty our work for the standard, 1 year, state law. If clients request a longer warranty period ACI can accommodate.